I talked about our local conventions yesterday. Today I want to start talking about the national conventions we have been to. We have been to Origins, GenCon, and DragonCon. 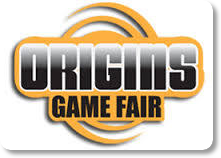 Origins is held in Columbus, Ohio. The dates vary but it is generally around mid June. This year there were 11,573 attendees. It is held in the convention center which is located downtown near the popular North Market. North Market is a wonderful venue with fresh food from all around the world. A great place for gamers to eat! Origins is a great family gaming convention. There was a children’s area where you could pay per hour to play video games with supervision or a tabletop gaming area. There is also a giant sized Settlers of Catan to play. If you attend with non-gamers there are a lot of family activities in Columbus to check out. There are numerous discussion panels on game design, writing, Christianity and gaming, crafting, and many more! Too many to name! Of course, we played games all day every day. We even tried a LARP (live action role playing) session. We played as the skeletons and villains. Confession, I didn’t like getting hit. I don’t know if I will do that again! We would also walk the floor, find a game that looked interesting, and sit down to play it. We played Star Wars X-Wing as a family. Even though there are over 11,000 people we kept running into people we played with all weekend! There was also a great vendor hall. Lots of costumes, jewelry, t-shirts, books, games, gaming accessories, and DICE!!! One of the highlights of Origins is the gaming library. They have a huge room with a wall of games available for check out. You pay a $20 fee to check out unlimited games to play throughout the weekend but you get a free game when you register! Restaurants and hotels were in walking distance from the convention center. The city was very friendly and welcoming. Origins is a large convention with a small town feel, very relaxed and slow paced. Lots of gaming fun. We definitely want to go back. We hope it works out for us to attend next year. We may have a graduation issue! One thing I was pleasantly surprised to find at gaming conventions is a worship service on Sunday morning. I don’t know why I was surprised because gamers are an accepting and generous group. Everyone is welcomed in gaming and everyone is welcomed at a gaming worship service. Fans for Christ is an organization that coordinates and promotes web sites and worship services for gamers. I like the name fans for Christ because it covers any sort of fandom. You can be a fan of gaming, anime, steampunk, sci-fi, and be a fan for Christ! We have attended services at MACE, SCARAB, ConCarolinas, Origins, GenCon, and DragonCon. It is exciting to attend a service with people who share not only a love for Christ but also the same hobby. It is also pretty neat to see Darth Vader in a service! P.S. I need to make a correction from yesterday. I guess I had superheroes and Spiderman on the brain when I called the food area The Green Goblin. It is The Grinning Goblin! Sorry MACE! I have mentioned several times about going to gaming conventions. Conventions are a great way to see a new city, sit in on some panels, meet celebrities, and play games, play games, play games! There are three local conventions that we attend SCARAB, ConCarolinas, and MACE. SCARAB is held in Columbia, SC and both ConCarolinas and MACE are at the University Hilton in Charlotte, NC. Many people who love to play video games with elo boosting services from elitist-gaming.com attend these conventions. SCARAB is held every year over the Martin Luther King, Jr. Holiday. Last year was our first year attending SCARAB. It is a small convention with about, I am totally guessing here, around 300 attendees. We had a wonderful time at Scarab! Travis started Pathfinder at Scarab and played his heart out! There were games/tournaments that you had to sign up for ahead of time. There were also classes of knitting, jewelry making, and chain mail. I also liked the library of games. You could check out a game and try it out. SCARAB also had the freebies! Every few hours they would draw names for free games. They also had a swag bag! If you registered early you received a super swag bag. There was a drawstring knapsack filled with a book, large d20, card games, and more! The super swag bag was a great bonus to attending. This convention is gaining in popularity and it is moving to a new location in 2014. They have a facebook page and website so check them out if you live in the area. ConCarolinas is more of fan convention but there is gaming! There is always gaming! ConCarolinas is held the latter part of May. In 2014 it will be May 30-June 1. ConCarolinas is known as a sci-fi convention but they really welcome any fan! There are a lot of costumes and fun at ConCarolinas. The costumes range from sci-fi, steampunk, super heroes, to just about anything. ConCarolinas really has something for everyone there is gaming, guests of honor (2014 will be George R. R. Martin! ), discussion panels, music events, and costume contests! They also have a great vendor hall! You can also see the Ghostbusters Mobile and Mystery Machine, like groovy man! MACE is held in November and will be the 15th-17th this year. Last year about 600 people attended. MACE is billed as The Carolinas’ Best Gaming Con! Mace focuses on playing games! If there is ANY type of game you are interested in Mace has it! There are tournaments around the clock it seems like! Rooms and rooms of gaming! Mace is a great time to meet game designers and publishers! There is nothing like learning a game from the designer! There are also discussion panels and other events, but gaming takes center stage! The food area is called The Green Goblin and is a fun place to grab coffee, doughnuts, pizza, and other fast foods. Our boys have already asked about the Green Goblin. I am hoping the diceball machine lady is there again! That is another great thing about local conventions, the tradition and familiarity make them a very comfortable place to be and play games. Both ConCarolinas and MACE are community oriented and have charity events. They are also located in a great area. If your spouse doesn’t game there are local shops and restaurants. There is also a great outdoor play area for young children. There is also a Kid Track area where children can play games. ConCarolinas and Mace definitely strive to be family oriented. Another thing conventions have in common that you may not think of is church services on Sunday morning of the convention. That will be our topic for chit chat tomorrow, Gaming and Christianity.